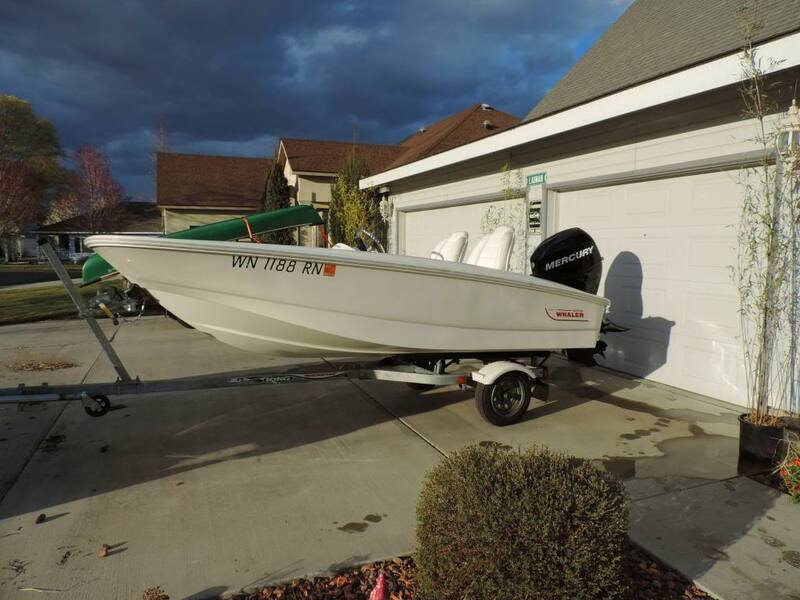 This is our 1966 Boston Whaler 17 that has been in the family for eons. We will probably never sell it. We have redone it 4 times. The third time we regelcoated it. This time it was all new wood. Both my sons and grandsons have learned boat handling and skiing with it. Notice the trusty Danforth on the bow rail. Was driving with my wife the other day when I spotted a 18' early 80's Outrage (when they still had the teak caprails aft) for sale. I hit the brakes, and signalled. I didn't even get to start the turn towards the boat. Apparently I am not "allowed" any more boats until the kitchen renos are complete. No need to hide. No, not for sale. I'm hoping great grand children will be using it. It has served us well. It has a very late model Merc 90 4 stroke. My Blackfin is a 1976 that we have redone twice. One of my sons has a Boston Whaler 26 with twin 250 4 strokes on it. Solid boats! Sometimes we will trailer the BW 17 to down where Moonstruck may be. The grandkids get a real kick out of the big Sabre getting up and cruising along side of them. I do too. I love being on the water with my kids. My family had a BW 13' for all my teenage years. I put many a mile on it running around Penobscot Bay. My father gave it to my (now ex) wife when we got married. Then my present wife and I had a 13' for my kids for awhile. My back gives me twinges whenever I remember pounding across a chop at speed in it. It was definitely not a soft ride but it was a stable, safe boat for a youngster. Yeah, you definitely don't want to be riding on the bow in a chop. It actually just skims along the top of the water. We have trolled 4 rods and 2 hand lines off the back of it. Run it off shore. It bobs like a cork. It is a hoot for running inlets. When you are in the trough with one breaking behind it looks huge. Wanna be windows and a wrong type, and sized anchor in one post! All kidding aside she's a beauty! Out of Houston a guy I knew had one with the fiberglass console. He took it out cut it down brought the fore deck back, used it for tankage, around 50 gallons. Added a leaning post. He would go out over 50 miles. Great, safe sea boat. Kinda wet and can be rough but will bring you home. Trust it more than boats much larger. Very cool. I've got a '65 that I've owned since I was 14. Just finishing up a restoration on it now. It's #2 or 3 as well, depending on how you count. Tried to sneak in a dinghy anchor debate. You caught me, Ben. Shhhhh, don't tell the moderators. After years of inflateable dinghies, and hours of cleaning them, we decided to try a BW as our new dinghy. Despite being told they will mar the mother ship, are difficult to lift on board etc., we did go ahead and purchase one. It's an 110 Sport model with a 25 hp four stroke Mercury. The bottom line is we absolutely love it. It has a sturdy rub rail, higher freeboard than the older Whalers, a new hull design and rides like a dream. We added two options; a bow rail, and a towing eye. She was built to order as the tow eye must be molded into the hull along with a backing plate during construction. The above posts confirm our belief that she will last a long, long time. As we did our shopping, and comparing new RIBs to the Whaler, we discovered that the Whaler was less expensive than a comparable new RIB. The Whaler does not come with a patch kit or foot pump! As a final note, we were pleasantly surprised to learn we could buy it from Costco, delivered through MarineMax and a wonderful discount. When one of my sons moved down to Miami, I did a redo on the Whaler. It was trailered down and left at Hobos Marina on Key Largo. It was there, and miraculously unharmed during Hurricane Andrew. We had a great time running around the keys and hanging on moorings over the reef. That boat has given many great times to our family. When we had a trawler, it served as our dinghy. We would anchor, and my sons would be gone most of the day with it. We We bought a 2010 13' SuperSport in April and love it. We like being able to trailer it to distant lakes and in June took it to 3 lakes in Northern Idaho. My grandson, age 4, likes to drive it and by the time he's a teenager I'm sure he'll be able to take it out by himself. There is a 1988 model 13 ft with an older 2s 40 hp yamaha and trailer for sale not far from me . How heavy do you think this would be ? I was thinking this would make a great dinghy but I would eventually like to be able to haul it on top. I have the space on top .Probably would have to beef the top up some and add a heck of a crane .Maybe go with 20 hp to help with the weight . hmason,Do you tow yours only or to you store it ? Whalers make good tenders if you can deal with the weight. On Pack Mule, I would think it would a towing tender only. I think so to . What ever I wind up getting I would eventually like to store it on top . Right now I have a Walker Bay 8 rowing . We will probaly only do the river and a little of the loop. It would be nice to have something to cat around with while at anchor or at the marina. I'm not sure that I would want to deal with the towing thing all the time .I know an inflatable is probably my best choice . I've never owned a new one but have had 2 used ones and they both were on their last leg when I got them . Any suggestions ?